Soviet war posters like “There is something to drink for,” bottom right, and “Don’t blab,” top right, are on show. 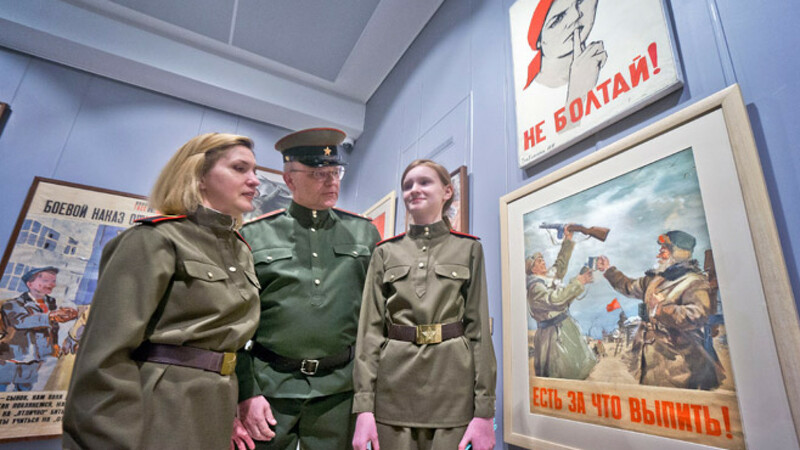 Over 300 exhibits of wartime art have been crammed into three rooms of ArtStory Gallery, varying from propaganda posters, letters and stamps to drawings of tanks, in an exhibition that tries to give a glimpse of life on the Soviet front line from 1941 to 1945. The exhibition called "The War Is in Me," a line from a poem by Yury Levitantsky, who fought in the war, aims to provide a "portrayal of life during war," said one of the curators, Olga Yeshtova. "Everyone was always on the verge of tragedy and heroism. We wanted to show how people lived through these harsh times." The exhibition only showcases works or written documents by artists, wartime correspondents and volunteers who were on the front line. "We tried to create a soulful and touching project," said Olga Tomson, another curator. "There are 60 artists on show in these halls and only two are alive now. We want people to remember the horrible events of the past. This is the goal." The project is designed to celebrate the 70th anniversary of end of the war, but curator Mikhail Oppengeim was keen to point out that "this sort of exhibition is a very personal one. It is not a propaganda exhibition but a human project." Pointing to wartime propaganda posters such as the famous "Don't Blab" by Nina Vatolina, Oppengeim said, "We have to respect history. It is what it is. These works present life as it was." The exhibition also has a wartime motorcycle on display that was used to get around the fronts, and a replica of a wooden wartime dugout which visitors can get inside. 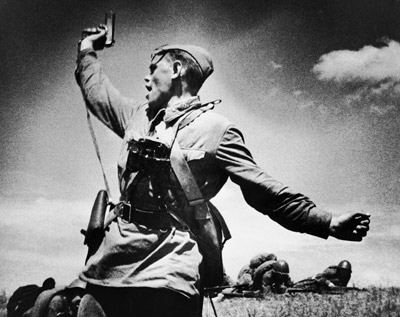 "Combat" by Maks Alpert is one of the most famous Soviet photographs. One iconic photo on show is "Combat" by Maks Alpert, which shows a battalion commander leading his soldiers into battle seconds before he was killed. Many of the exhibits are works of art done by both famous artists like Alexander Labas, whose art cycle "Moscow and Moscow Region in the Days of the War" is on show, but there is a focus on work artists did for themselves, away from the censor, showing the true hardship and tragedy of the war. Pyotr Baranov fought in the war, but, an artist by training, he continued to draw Soviet soldiers going about their daily lives. "He did not have an inkling of the feeling that he could die the next day. He was simply doing his job," said Oppengeim. "This may seem strange to hear, but these artists installed their exhibitions on the front line," said Yeshtova, "Kilometers from the enemy, they presented their works of art to the troops. Nikolai Zhukov was a famous poster artist before the war, and his work for the Intourist travel company won an award in London in 1935. He was on the front line as a correspondent with the Pravda newspaper for the whole war and his drawings from the front are on show. 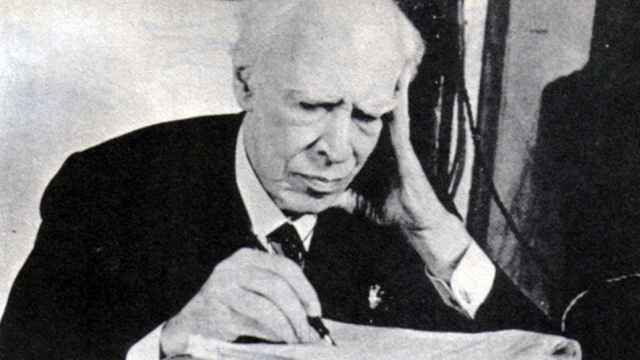 He would later go on to attend and draw proceedings at the Nuremberg trial after the war. "We especially want the younger generation to perceive and embrace this culture. This is why we are not displaying war-themed works of art which were made post-1945. We only took works of art from 1941-45. These are the works that emitted a pulse that we still feel today," she said. "The War Is in Me" runs till May 10 at ArtStory Gallery. 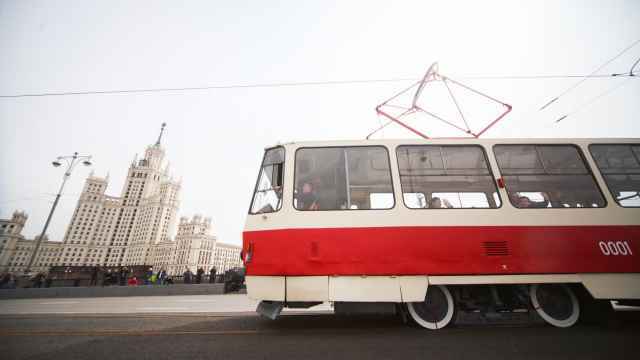 14 Staropimenovsky Pereulok. Metro Tverskaya, Mayakovskaya. Tel. 495-650-1343, art-story.com. 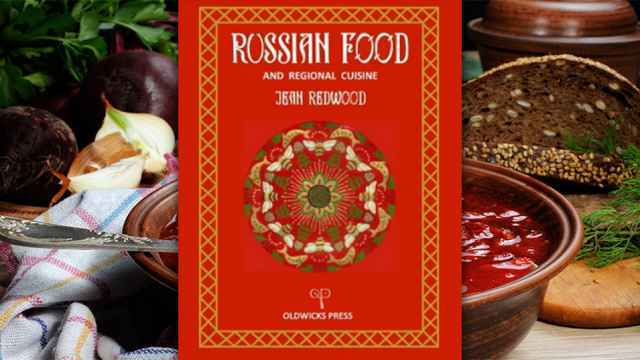 What better way to spend the weekend than reading about, cooking and eating great Russian food?